May 1. Sudden energy crunch forces Juneau to conserve electricity. An avalanche cut off their hydro power and now electricity costs five times as much, so suddenly they're all using candles and clotheslines. I think this is an accurate preview of the powerdown: industrial-age energy will not go away, just get more expensive and less common, and when people get their backs against the wall, they will adapt. May 3. 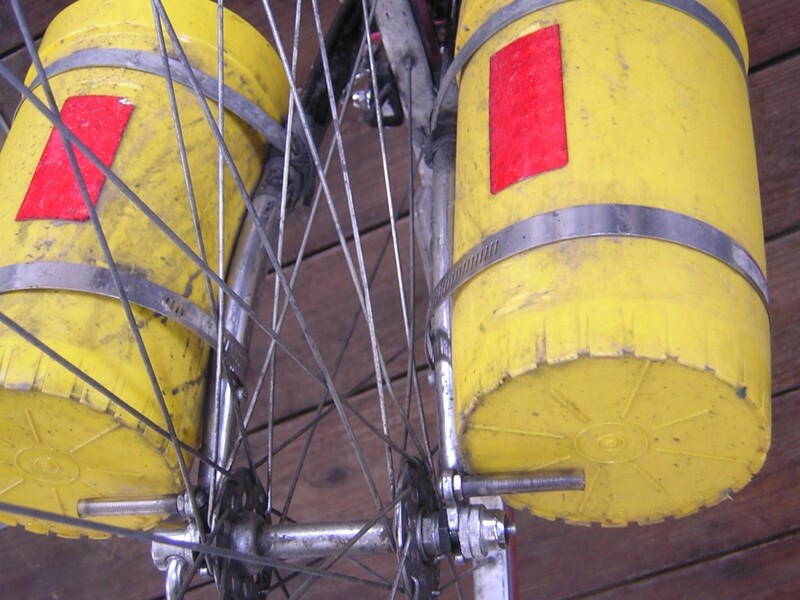 Tom sends a link about how to make bike panniers from four gallon plastic buckets. Also, here's a photo of my own tupperware pitcher front bike rack. The metal bands are those thingies, I don't know what they're called but you see them around stuff on basement ceilings and you can get them at hardware stores. The bottom bands are held on merely by their own tension and the nubs on the front fork -- which not all front forks have. The upper bands are held on with thick glue, wrapped by tape, wrapped by wires. Those bolts on the bottom (covered with plastic tubing) are also necessary to support the weight. I chose tupperware pitchers because they're the perfect size to hold two-liter water bottles, and I wanted to put water up front to equalize the weight on long trips. But if you do that, you need some padding on the bottom or else tiny rocks will get in there and puncture your bottles. The photo is from below and behind the pitchers. It looks weird because it was taken with the bike upside down and then flipped. May 6. Depressing article from Orion magazine about the invention of consumerism by evil elites in the 1920's. Our American habit of buying and buying and never being satisfied did not arise naturally, but was the calculated result of years of propaganda. Also, the reason we have a 40 hour work week and not a 30 hour work week is that people like Edward Bernays, who was probably the Antichrist, thought that leisure time would make the masses too hard to control. May 7. Interesting link from Anne, Nightwalking. The author's thinking is sloppily credulous, and he falls for the myth that vitamin A will improve your night vision, which is only true if you're deficient. But there are also some good ideas, and his main thesis is exciting: you can get into an altered state of consciousness by walking around continually focusing your attention on your peripheral vision, especially if you do it at night. May 7. I've been meaning to track down my favorite Sesame Street cartoon, which I hadn't seen in 35 years. I remembered it started with a white cylindrical object being moved by an ant, and it zoomed out to bigger and bigger things, including a zoo, until finally at the largest scale it circled around and became the little thing again. Well, I found it! Its strict title is Infinity and it's better known as That's About The Size Of It. Those links go to two different copies on YouTube. It's even better than I remembered! May 9. Youngstown Ohio embraces shrinkage! Now, in a radical move, the city is bulldozing abandoned buildings, tearing up blighted streets and converting entire blocks into open green spaces.... Already, delegations from smaller, post-industrial cities like Flint MI, Wheeling WV, and Dayton OH, have come to Youngstown to study the plan. May 9. This NY Times article about Steampunk fails from the start by being in the fashion section. The correct and more radical category is technology. If you look past the Victorian frippery, Steampunk is a technological ethic that trades the factory for the garage, standardization for uniqueness, and "progress" for a mix of tools from every age. And here's an exciting idea that could help, TechShop: for a monthly fee, anyone can get access to hundreds of light industrial tools, classes on how to use them, and a community of inventors and tinkerers. May 12-13. Scary article: Lots of animals learn, but smarter isn't better. Basically, scientists bred fruit flies to be fast learners, but then they were outcompeted by the slow learners, and regressed. This is troubling because it raises the possibility that humans work the same way. If we're getting smarter, is it only because of the rapid change of modernity? And if we shift to a physically challenging, slow-changing world, will we get stupider? First, there are a bunch of different definitions of "intelligence". IQ tests, for example, measure skill in detached manipulation of abstract symbols, which is different from a popular definition, "the ability to learn." But learn what? In the fruit fly experiment, we assume they're learning habits, since we don't think fruit flies are capable of abstract thought. But as humans, we can learn on many levels, including habits, skills, and mental models. And then there's a difference between quickness of learning, quantity of learning, and depth of learning. And there's a difference between learning something new, and erasing something old and replacing it with something new -- which is not the same as the ability to perceive the need to replace an obsolete model with a new one. And that's not the same as the ability to act on the updated model. To immediately recognize a difference between the map and the territory, correct the map, and adjust our behavior, is the key skill for mental-map-making creatures like humans. If we had it, almost everything wrong with the world would be fixed. But it's not measured by any intelligence test I've ever heard of, it may not be increasing, and it might not even be good to call it "intelligence". I like the fruit fly experiment because what it tests is somewhat close to what humans need: to observe a change in the world, like "the industrial lifestyle is causing a climate disaster," and to change our behavior accordingly. What worries me is that if we have a post-crash world that changes very slowly, there will be no evolutionary pressure on us to learn to adapt mentally to change. And until we learn to effortlessly update our mental models, or to not make mental models in the first place -- until we lose our brainpower or lose our blindness -- we're just going to keep going out of balance. May 16. Last night I was poking around Daily Kos and stumbled on Dogemperor's Diaries. Here's a post from April, Hillary Clinton member of "cell church" run by The Family, and a Harper's piece on The Family, also called "The Fellowship". But it turns out this is something much more troubling than an elite networking group with a right wing agenda. Even conservative Christians like Pat Robertson have condemned the cell church structure, because it's basically a pyramid scheme of abusive relationships. It's used by many shady groups including Scientology, the Hare Krishnas, and Amway, and it's still growing. The percentage of males who came out ESFJ went from 2.58 to 26.37 to to 54.23 while the percentages for females went from 5.10 to 34.31 to 53.48... Among those who started as extraverts, 97 percent remained unchanged, but 95 percent of those who started as introverts changed into extraverts... Among those who started with a preference for a judging orientation, 97 percent remained unchanged, but 95 percent of those who started with a preference for a perceiving orientation changed. It is not healthy to pressure a person to deny his or her true type and become a copy of someone else. Trying to change a person from one psychological type to another is like spanking a child for using the left hand. One does not produce good right-handed people that way. One produces very poor right-handed people who are very frustrated. Dogemperor speculates that since joining The Family in 1993, Hillary Clinton has moved from INTJ to ESTJ. This would explain a lot. A natural Introvert forced to be an Extrovert would seem phony and insincere, and she would lose her internal sense of who she is and what she stands for, and constantly shift her persona looking for external validation. There's also a new book on this, The Family: The Secret Fundamentalism at the Heart of American Power. May 20-21. Just put a new Terence McKenna headquote on the home page. Thanks David for listening to McKenna mp3's and finding his wording, which includes the exact words I used plus a few more that I left out. Alice wonders: who is "Tamo-San", the author of the quote that was at the top of the home page for the last few years? I don't know either, because there is almost no information about her online. Her real name was Ryoju Kikuchi, and that link goes to a very small Wikipedia page. I found the quote in John Hogue's The Millennium Book of Prophecy, and I've now restored it to the quotes page. May 21. Yesterday I finished James Howard Kunstler's novel World Made By Hand, and I highly recommend it. It's one of very few works of fiction that I would call "soft postapocalypse" -- set a few years after a collapse, but not a collapse to the stone age or every man for himself on desolate plains, only to the way people lived before the industrial age. Kunstler is not a peak oiler dabbling in fiction -- he knows how to write a novel. The story moves along, and the characters are complex and alive. What I'm most impressed with is how well he balances two of the most popular post-crash visions, which you could call Happy Amish and Murderous Warlords. The protagonists are trying to keep a small town alive, squeezed between a neo-feudal estate, a settlement of lawless scavengers, and a newly arrived Jesus cult. As I mentioned in my review of The Road, no speculative fiction writer is really trying to predict the future. Try it and you'll quickly learn why: it's easier, more fun, and more valuable to create a world than to try to guess exactly what's going to happen. Kunstler wants to create a rough but somewhat seductive world with extremely local politics and a mostly medieval level of technology. So he gets rid of the federal government with an atomic bomb in DC, and gets rid of more than half the population with disease epidemics. Either of those could happen, but I'd be surprised. And I don't think there's any way we'll lose bicycles or dogs -- even on ruined roads with improvised tires, bicycles are too energy efficient to go away, and people just like dogs too much. May 26. Marcus sends this Steve Talbott essay, Technology and Human Responsibility. It's very hard to read, but I'll summarize: 1) The industrial view of nature as a lifeless resource is wrong, but so is the common environmentalist view of nature as a sacred place that we should leave alone. And what these views have in common is that we're disconnected from other life. 2) The right way to connect to other life is to engage it in a respectful, unpredictable, back-and-forth relationship that we can call a conversation. 3) Shocking rule: You can do anything as long as you take responsibility for it. The hard part is using the right definition of "responsibility". This strikes me as a much more ethical version of the rule, "Reality is what you can get away with." 4) The human ability to be detached and make moral judgments has done a lot of harm in the past, but we can embrace it and use it to serve other life in ways that no other species can. We cannot heal a landscape without a positive vision for what the landscape might become -- which can only be something it has never been before. May 27. New David Holmgren project, Future Scenarios. It starts out with a nice overview of energy decline and climate change, and then goes into four scenarios defined by the severity of those two factors. I think the more important variable, and also more unpredictable, is how humans react. A good reaction in the worst scenario could lead to ecotopia, while a bad reaction in the best could lead to catastrophic collapse. Also, both environmental and human factors will vary greatly by region. How exactly will your local climate change? Where does your electricity come from? Where does your water come from? How far away does your food come from? How easy is it in your climate to grow gardens or fruit trees? Do you have any tradable resources? How physically healthy are the people? How mentally healthy? Will they tend to form into violent gangs or stay peaceful? How easily will they adapt to learning gardening and light manufacturing and getting around without cars? How intelligent and and unselfish are your local political leaders? There has not been a universal collapse in all of history, and I don't think there's going to be one this time, because regional variability will enable some regions to thrive while others disintegrate. The thriving regions could even counteract a general collapse by taking in refugees and donating things like bicycle tires and water purifiers -- or they could make things worse by importing slaves and exporting guns. May 28. New Gary Brecher piece, How Birthrate Is Turning Modern Conventional Warfare on Its Head. Basically, with our modern reluctance to openly mow down civilians, plus innovations in asymmetric warfare and nonviolent tactics, raw human population is now the most powerful weapon. I'm trying to figure out how this fits into collapsism. Energy decline and climate change should lead to food shortages and population decline, which means either birthrate reduction or piles of dead bodies, or both. Yesterday I predicted that some regions will thrive while others collapse, and we know that there's an inverse relation between standard of living and birthrate. So it seems likely that the failing regions will put a lot of population-war pressure on the successful regions. By the time the process is finished, the people who remember how an advanced civilization used to function are long in their graves, and anything perishable in the material culture they knew has long since perished. June 5. This article, A freelance lifestyle in a corporate workplace, is about a radical new workplace environment where workers can do whatever they want as long as they get the job done, and of course they get the job done better than in the old model where they're degraded and micromanaged. This refutes the idea that corporations = profit = evil, because here's an evil environment that interferes with profit. So if corporations are simply profit machines, where does the evil come from? It comes from humans! Humans who have been abused and controlled themselves can't stand to see other humans be happy and free, so they perpetuate the crushing workplace environment. And remember that it was humans who designed corporations in the first place to take more than they give with perfect indifference to external costs. The much harder and more important question is: Where does human evil come from? June 5-6. I am not expecting full industrial collapse, especially not in the Cascadia region, but I can't rule it out, and I'm quite sure the dollar will continue falling, so I want to put my savings into useful stuff while it's still worth something. Yesterday I paid out of pocket for a dental checkup and cleaning, and today I got something I've been meaning to get forever, a wheatgrass juicer. This is a survival tool, because green grass is loaded with sugars and nutrients, if you can separate the juice from the undigestible fiber. I did some research and the Hurricane is the best one. A few other survival items I bought recently: a Fluke 117 digital multimeter, a really good LED headlamp, a SteriPEN UV water purifier with solar charging case, and a bunch of bike tools and spare ball bearings. And some other items I've bought and recommend: A Global Sun Oven, a Gransfors Bruks small forest axe, a Sierra zip stove, a Corona hand grinder (cheap and good for all coarse grinding), a Hori Hori digging tool (basically an unbreakable hand shovel), a Fiskars all steel digging shovel, and some eneloop batteries, the state of the art in rechargeables. And after a lot of thought, I decided not to get any guns. What it comes down to is that I just don't like guns enough to put enough attention into them to get good at using them. I'm not going to add another tedious chore to my life unless I'm 100% sure it's necessary. So instead, with help from a massive reader donation, I got a crossbow! For just over $700 from the Bow Hunter Superstore on eBay, I got an Excalibur Phoenix, the best-buy model of the highest quality crossbow maker in North America, plus a "right stuff" accessories package with varizone scope, and a good shock and noise dampener. At the moment, it's still illegal for me to hunt with it. Here's a page on crossbow hunting regulations in the USA and Canada. June 11. For the last few weeks, John Michael Greer has been writing about the need for "cultural conservers", like the monks in medieval Europe, to keep the best parts of our culture alive through a long decline. Morris Berman wrote a book about the same kind of thing, The Twilight of American Culture. 1. What did the monks really save that was worth saving? Offhand I can't think of anything. Another Greer post mentioned that after the fall of Rome all the pottery got broken and nobody was making more. So why didn't the monks save the pottery industry instead of, say, Aristotle, a boring categorizer who would be better off completely lost? The majority of the "learning" of the Roman Empire was actually preserved intact in the universities and libraries of northern Africa and Al-Andalus. Even as Europe fell into a dark age, the Arab and Muslim empires continued the scholarly tradition unimpeded, and were able not only to retain the classic texts, but make significant advances in metallurgy, anatomy, mathematics and philosophy. Intellectualism and science seem to require a cosmopolitan culture with some good physical resources remaining to it. In the 21st century some regions will disintegrate while others thrive, and it's anyone's guess who the next "Arabs" will be, or where exactly they will make advances. 3. Maybe what the monks were really preserving was a cultural tradition in which being a thinker was worth something. But I remember Fredy Perlman pointing out that the monasteries later grew into the bureaucracy that enabled the church to be so powerful. 4. We also need to keep in mind that the "dark ages" were a great time for Europe's nonhuman populations, and that even many human populations welcomed the fall of Rome. And there was also plenty of underground transmission of pagan cultures and herbal lore and a more ecological world view. 6. A week ago in this post, Greer pointed out that complex cultural artifacts often pass through "dark" ages in the form of religion. At the end he raises the fascinating possibility that what we call "science" could be the religion-like belief system that does it this time. 1) In the middle of Turkey is a region called Cappadocia, with rock that's both strong and easy to carve, and it's been carved full of underground cities that are totally like the Mines of Moria in Lord of the Rings! 2) Elephants eat trees. In Africa, the landscape cycles, with elephants eating trees and bushes, allowing grass to grow, and then cattle eating the grass, allowing trees and bushes to grow. North America used to have elephants (mammoths), and when they went extinct, it's likely that the forest increased because there were no tree-eating creatures left, until the Indians again thinned the forest for hunting and farming. We like to think "forests good, Indians good, mammoths good," but in reality they often work against each other, especially if we believe that humans exterminated mammoths. And the guy who came up with the pleistocene overkill hypothesis wants to bring elephants back to North America and set them loose to eat mesquite in the southwest. Rubber can be recycled, but it's kinda labor-intensive. A strip of car tire could be cut to fit around the rim, and meet at a shallow diagonal so that it doesn't affect rolling any more than the tread would. The same chemistry that made the tire can also be used to add more to the molecule. The re-treading of tires involves spreading unvulcanized rubber onto already-vulcanized rubber, and heat-treating them both until they're bound chemically as if both were vulcanized together. I could see Americans of the far future growing a cactus or any of the many other latex-producing plants, and importing sulfur from volcanic regions, to glue cut pieces of long-buried tires into new, useful shapes. June 27. The big news yesterday was the Supreme Court ruling that the Second Amendment gives individuals the right to own firearms. On a simple philosophical level, I'm happy about this. I don't think anyone should have a monopoly on any kind of power, including deadly force. Anything the police and military can have, the people should be able to have. But on a practical level, I don't see how any good can come out of more guns in the present society. Here's what I wish they had said: Governments can make laws that you can't own any guns, not even a squirrel-hunting .22, unless you're a member of a well-regulated militia, with rigorous weekly training, not only shooting, but hard exercise and wilderness survival and all kinds of skills that would be useful in defending your local area from conquest. And when you've been through enough training, you can keep and bear fully automatic rifles and rocket-propelled grenades and surface-to-air missiles. That's the kind of thing that Jefferson and Madison had in mind. Imagine how much nicer the government would have to be, and how much less we'd be afraid of "terrorists", if American gun lovers were ordered in thousands of tight, highly disciplined cells, instead of being a bunch of disconnected individualists occasionally turning off the TV to shoot at beer cans. But then, I'm wondering if violence itself has become obsolete. Surveillance and remote killing technologies are now so advanced that any violent resistance group will be crushed. And conquering empires are equally paralyzed because the only thing that really works, large-scale massacre of civilians, is now forbidden. I think the appeal of speed is that it's inherently dangerous. We don't get enough real danger in our daily lives, not the kind of immediate danger you can fight like a lion or another tribal warrior. Cars are the riskiest thing that most people allow into their lives. I had the idea that there was a fuel economy peak around 45mph, but Roger sends this Oil Drum article where if you scroll down about 20%, there are three graphs showing that many vehicles peak around 30-35mph (48-56 Km/hr) and drop off steadily above 40. Also, why is it that the word "performance" gets attached to a Ferrari and not to a Honda Civic wagon? By the same logic, Youporn is a high-performance website because you get strong shallow pleasure from it, while Wikipedia is low-performance because it does useful tasks with great efficiency and no flash. The fallacy behind the popular use of "performance" is that speed and acceleration have use value, when in reality they have only pleasure value, unless you happen to be fleeing a tornado. Of course, pleasure is good! It's just that we get in trouble when we confuse it with usefulness. Another example is TV news, which tries to inform and titillate and ends up doing a terrible job of both. Ideally, we would move people and goods with bikes and trains and barges and dull low-power cars, and then we would have race courses where anyone could drive fast for fun.